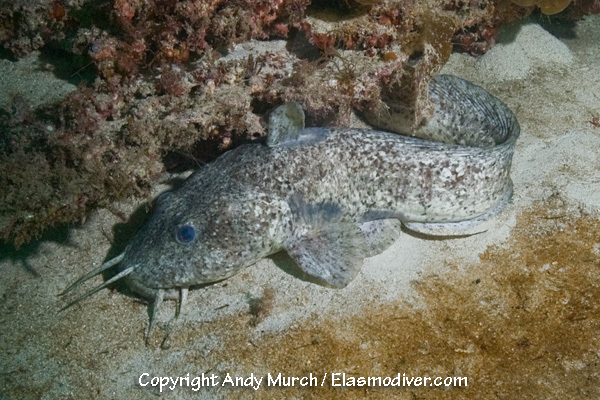 The estuary catfish (Cnidoglanis macrocephalus) is also known as the cobbler, estuary cobbler, deteira, South Australian catfish, or Swan River catfish. It is found in river systems, estuarine environments and rocky near shore reefs of Western Australia. These estuary catfish pictures are available for commercial licensing. For further information regarding usage please e-mail Elasmodiver. All of the images on elasmodiver.com are copyright protected. No unauthorized use of these estuary catfish pictures is permitted. Please contact Elasmodiver for further information.